After giving the first book in the Templar series, The Lost Treasure of the Templars, a lukewarm reception, why would I read the second one? That’s a fine question. First, this is supposed to be a trilogy, so the first installment ended with unresolved plotlines (for example, the main plot). While flawed, the first book was also just interesting enough to make me curious as to what was going to happen next. So, I bought the book, meaning the author did his job and hooked me in. Our intrepid, trained-better-than-James-Bond, yet average, everyday heroes have returned to England to face the authorities and figure out where to go next. They only have pictures of the treasure chests discovered on Cypress, but, with a little luck, maybe they can figure out the next clue. Thankfully, the evil bad guys are stuck with paltry resources – they only have millions of dollars at their disposal and a multitude of experts on the medieval world, Templars, and codes. It’s no wonder our heroes figure it out long before the baddies! Now they’re back on a cross-country trip through Europe. But there is more than just one group after them now. 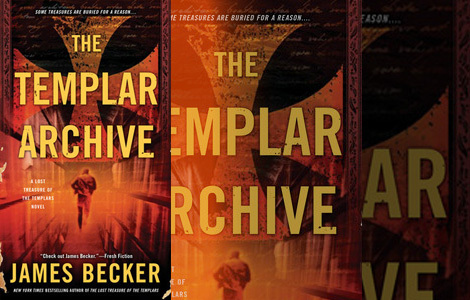 While suspending disbelief is still a little tough at times, this second novel in the Templar trilogy by James Becker is better than the first. There is still a lot of action and inept assassins, but the book fulfills a level of adventure that the first one only promised (it’s like a second marriage, right?). There’s more exploration and clue-solving. The author also steps up the game by making the treasure something other than money or lost gospels that prove Scientology is the only true religion (though the third novel is yet to drop, so who knows). It’s a plausible treasure, too, which made the story a lot more fun. The thing with this author, based on the two novels I have read, is that I like his prose and his flow of action and even his overarching ideas. It’s just the characters that lack. The best characters have flaws that rear up and affect the story. These flaws not only can lead to tension and suspense in an action story, but they also give the characters something to fight against and overcome (or not). The main characters here have no such flaws. It comes off like they’re out on an afternoon jaunt. If you can check your brain at the door, you should have a lot of fun. I’ll probably read the third one when it arrives in bookstores, just to see how things shake out.